Pretty Things: Bead and Button 2011! OK! Forgive me for the rapid post, but Cindy and I are sitting in the lobby, the only place we can get an internet connection, to give a quick post about Bead and Button before heading out for dinner. YES! I did say "CINDY and I"! Because two days before I left Cindy called to surprise me -- she'd just bought plane tickets to join me at Bead and Button. 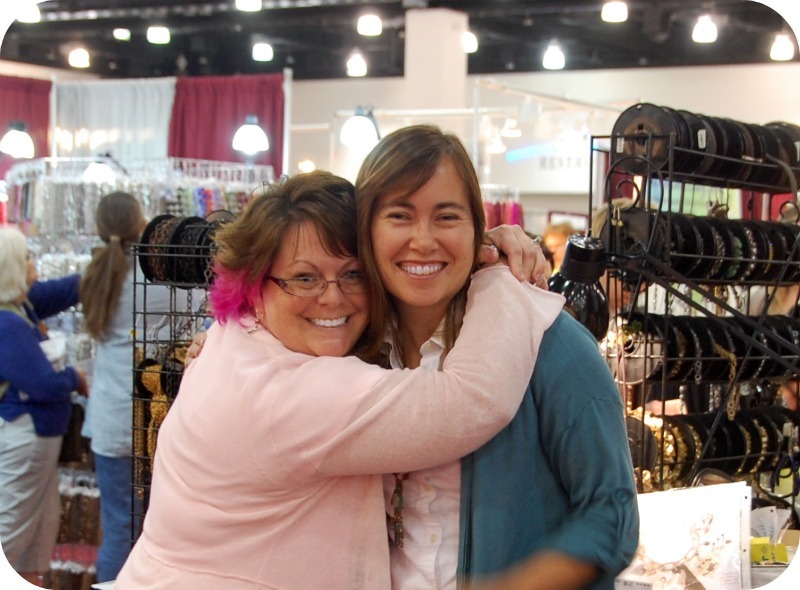 Bead shows are so much more fun with friends, and to say Cindy and I had fun over the past two days is a supreme, sublime understatement. This photo was taken after about, oh, five minutes on the show floor. Lots more to come -- videos (and I just said I hate videos), gifts, and shots of some minor loot. I wish you all were here with us because we would rock this hotel to the GROUND. Glad you are having a great time! Rock on! Lori you two are just radiating happiness and fun! Your pink hair is so YOU!!! Love it. I'm sending a virtual hug to you, since I can't do it in person! Ohh, seems the both of you have a incredible good time. Wish I could join you! Great picture! So glad you guys are having a great time! fab shot of the pair of you, looking SOOO happy....must be the thought of all that gorgeous-ness surrounding you!!! haha! You and Cindy looking good! You are so right it is more fun when you have a friend to share the experience with. Looking foward to hearing about your adventure at the Bead and Button Show. Ohhhh so fun! What a great surprise! Have fun in bead heaven - I'm looking forward to more updates. Next year I am there - even if I have house guests! Yes it is definitely more fun with friends, we always encourage each other to spend "Oh yeah, you need to get that" LOL have fun, can't wait to see more! Oh my sweet Lori I think this is just what you needed and send Cindy a hug for me too! I think her surprise was awesome! Hugs and maybe someday I can party with the 2 of you too! As I said to Cindy, shows are more fun with friends -- way more fun. I'm so glad she's there with you. Play on. Have fun! Keep posting! Love the vicarious life I lead! Awww how sweet - yes life is better with a friend! You two look like you had a ball! Aren't surprises the BEST! Hope you gals are having LOTS of FUN! Can't wait to hear all about it! How wonderful! It's apparent how much fun you ladies are having :) Enjoy the hunt! Love that great, big smile on your face Lori. I so want to be apart of that group hug. This is such a wonderful photo. Glad you are there together. I wish that we had been able to shop and talk a bit more! I am so glad you had fun. It was a BLAST! Oh, my gosh! Have fun for us! :D I can't wait to hear all about it. Someday maybe I'll get to meet you at one of these things. That would be awesome! You guys are glowing! What a blast! Lori, Great Photo, And it thrills my heart to hear you sooooo happy. I am blessed and thrilled to hear you and Cindy had such a great time together. You are right. So much more fun when sharing with a friend. Hope I can join you guys next year, hope you had fun!!!! GREAT SMILES! I'm having fun just looking at the two of you. Thax for sharing.